The Ultra-low energy electrostatic Storage Ring (USR) at the future Facility for Low-energy Antiproton and Ion Research (FLAIR) will provide cooled beams of antiprotons in the energy range between 300 keV down to 20 keV and possibly less. The USR has been completely redesigned over the past three years. The ring structure is based on a “split achromat” lattice that allows in-ring experiments with internal gas jet target. Beam parameters might be adjusted in a wide range: from very short pulses in the nanosecond regime to a Coasting beam. In addition, a combined fast and slow extraction scheme was developed that allows for providing external experiments with cooled beams of different time structure. Detailed investigations of the USR, including studies into the ring’s long term beam dynamics, life time, equilibrium momentum spread and equilibrium lateral spread during collisions with an internal target were carried out. New tools and beam handling techniques for diagnostics of ultra-low energy ions at beam intensities less than 106 were developed by the QUASAR Group. 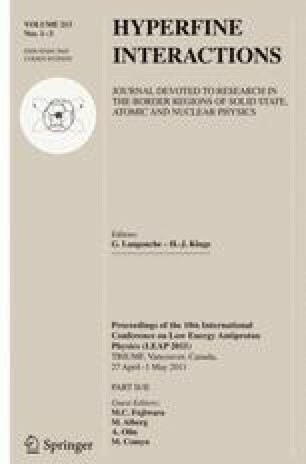 In this paper, progress on the USR project will be presented with an emphasis on the expected beam parameters available to the experiments at FLAIR.